Villa Ladomar - Las Brisas Guitarron - Incredible Bay View! MY NEW LOWER SUMMER RATE ARE A REAL BARGIN! PRIVATE VILLA AT LESS THAN HOTEL....JUST $137.50 per couple! PRIVATE VILLA in best area with staff and incredible view of ACAPULCO BAY. BOOK NOW! NEWS FLASH.......... BOOK NOW FOR YOUR , SUMMER, FALL 2108 and Winter 2019 and Holiday DATES! PLEASE NOTE...I DO NOT USE THE ONLINE CALENDAR SO CONTACT ME TO CHECK YOUR DATES! THANKS. Thank you for your interest in Villa Ladomar in Acapulco, Mexico....I think this is the one you will love! The US Dollar is strong to the Peso and Mexico is still a bargin! This is your chance to enjoy my beautiful Villa overlooking Acapulco Bay and very close to the famous Las Brisas Hotel. Located in Brisas Guitarron of the Las Brisas area which is one of premium residential ares in Acapulco and is known as the 'Gold Coast' where many movie and political personalities have built homes and is located in a safe and gated area. Located on over one-quarter acre of incredible tropical flowers and palms, this Villa is one of Acapulco's best villa values for One-to-12 people when traveling with children as we can add extra bedding when needed. This private and spacious, Four bedroom, Four bath Villa was constructed in classic Greek design in a true Mediterranean setting. All the bedrooms offer new split-unit air conditioning and private bath and have incredible views of majestic Acapulco Bay. A Jacuzzi Bath is also offered ajoining the newest bedroom. By night, a panorama of millions of twinkling city lights can be enjoyed on one of the Villa's 3 large patio's. A new large modern kitchen and The VIlla has Cable TV with english and Spanish channels and FREE wireless Internet! This Villa has been in my family for over 30 years and is updated is some way each year. By day....Relax by your private pool and sun terrace and enjoy the million-dollar view of Acapulco Bay while your servants cook, clean, and mix drinks. Plus a Pool with waterfall. You are just minutes from the best beaches, shopping, restaurants, and nightlife. If you are wondering what to pack, anything is acceptable that you would wear in 85-degree weather. Jackets and ties are never required for the men, but women can dress as formally or causally as they may like. Villa Ladomar and its staff makes for a fabulous get-away to Mexico. If needed, we can also arrange airport pick-up to take you to the Villa for about the same price as a taxi. Ask also about many other City Tours and sightseeing trips we offer. Take advantage of these low daily rates for a Villa of this size and location and the strong dollar in Mexico. Best of all is the great Staff and the VIlla which includes your own cook, housekeepers, houseman and a English speaking Villa Administrator that will take care of all of your needs and even pick you up at the airport with margaritas in hand! YOU WILL NOT FIND A BETTER VILLA OR A BETTER DEAL FOR SUCH A NICE PROPERTY. CALL TODAY! We book on a first-come-first-serve basis AND I DO NOT USE THE ONLINE CALENDAR..... so call or email us today with your dates. I OFFER A GUARANTEE that you will be pleased with your visit! Property Managed by Mark and Brian Cleveland Vacation Partners....book today! About Property Managed by Mark and Brian Cleveland Vacation Partners....book today! I own, manage and represent resort properties in 4 countries. Villa Ladomar has been in my family for over 30 years and I am sure you will enjoy it and Acapulco as much as we have over the many years. I have traveled the world and there are few views better than the one you will find at the Villa of Acapulco Bay. Its simply incredible! Being the owner of other vacation homes I know how important a good vacation is and this is why I work hard and the Villa Staff works hard everyday to make sure you have the best vacation ever! I am sure you will enjoy my Villa. I DO NOT use the online calendar so call or email me today to check your dates. Come Enjoy and you will leave well rested,well tanned and happy. 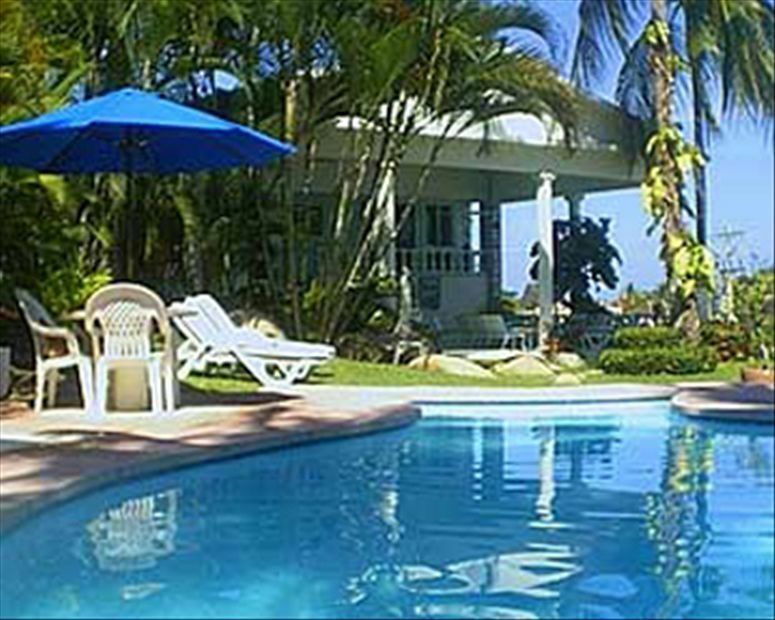 The Villa is located just below the world famous Las Brisas Hotel in the Las Brisas Guitarron area of Acapulco. You are in one of the very best area's of Acapulco and very close to Resturants, beaches, Shopping, Nightlife and FUN! The Villa is updated almost yearly in some way and offers many things you don't normally find in other Villa's. We have USA TV Networks, Wireless Internet and FREE USA phone line so you can call back home at no extra charge. Great Staff that works hard to make you HAPPY! View more about Property Managed by Mark and Brian Cleveland Vacation Partners....book today! Private Pool and Staff, Close to the Best Beaches, and Nightlife! Good spot for a group, great staff! First of all the best of this property: Kenny and Armanda could not have been more helpful during our four-day visit. Armanda is a super cook! Since the majority of our group was Mexican, we ate Mexican-style meals, but she is no doubt equally capable with other cuisines. We provided suggested menus and money for the groceries and left the rest to Kenny (to shop) and to her to prepare. Kenny was happy to run errands as needed, arrange for taxis, provide advice, etc. They live on the property, which is very helpful. The view from this home across the bay to the main part of Acapulco is like a postcard. It's location on the city end of the Scenic Highway, however, makes a trip into town relatively convenient. There are a couple of restaurants within a very short taxi ride. For the most part, they are high-end places offering neither family atmosphere nor casual meals. Si Señor (formerly Señor Frogs) is also nearby. We prefer to avoid the chaos of traffic in the main part of the Costera and therefore enjoyed businesses closer to the property. We found the house itself to be as described. The bedrooms are roomy, each with an en-suite bath. The upstairs bedrooms each have their own entrance to the outside, which is convenient. The main pool and patio areas are delightful, especially with the great view. We had a couple of caveats: the address of the house is useless in finding it, and the people at the security gate of the development were unable to provide any assistance. If you are not using the house administrator for transportation from the airport, be sure to get precise directions for how to arrive at the main entrance, which is actually at the rear of the house. The administrator charged 400 pesos for pickup at the airport, a bit more than an airport taxi would have charged, but worthwhile in getting to the property easily. There is a safety issue we hope the owner will address soon: at night time, the entrance from the rear requires quite a long walk along an unlighted path that involves walking alongside the secondary swimming pool and a couple of opportunities to trip on the path. Beyond that issue, we noticed some indicators of deferred maintenance at the property, but nothing that really interfered with a pleasant stay. All of the air conditioners, etc., worked properly. We would return on a future visit to Acapulco. Thanks for your visit and happy to hear you had a great time. Kenny is a great staff member and happy to help when needed. We are always working on fixing and updating the Villa and we did put lights down that walkway at night...thanks for the idea! Please keep us in mind for the next time. The property is really nice, with a unique view, a nice pool area and a super terrace. The service staff has a great servicing attitude, the cook and the bar-tender were both great. We had 4-5 things "lost" in the Villa (a watch, my Ray-Ban lenses and "some" toys)... the local staff blaimed a bunch of wild cats that live in the surroundings of the Villa and that they made us watch like policemen for our food and stuff. We had an episode of a cat stealing a heavy piece of meat that we took out to the sun to defrost. It was very strange to us, that the cats could steal the mentioned goodies. The Villa needs some maintenance, the fridge works seldomly, as well as the AC devices. Anyway, we had a VERY good time at the Ladomar Villa!!! Kenny and the cook are great! I certainly recommend it to everyone willing to spend some time in Acapulco!!! Thank you for your visit to Villa Ladomar and happy to hear you enjoyed your stay at the Villa and staff. I heard you group loved to party a lot! The AC that you were talking about is one of 6 in the Villa and the staff took care of the same day and also the fridge which I understand was working but not getting cold enough. Upon reading your comments Kenny our houseman did call you and found your items that you left behind at the Villa. Never heard about a "cat". I think that was the to much party effect talking. haha. Acapulco is a great place and a great value now. Glad to hear you already want to rebook and return again so please to keep us in mind for the next time!! Thanks. Great Villa and Staff...Incredible View! Our first trip ever to Acapulco and Villa Ladomar was really beyond our expectations. The Villa owner arranged for us to be picked up at the airport and we were greeted as we came out of the customs area by the Villa Administrator Jesus. About 20 min later we were at the Villa and greeted by the Villa staff that took very good care of us. The Villa rooms were large each with a private bathroom and each had a great view of Acapulco Bay. The cook made us breakfast each morning...really about anything you like she can cook. Kenny the houseman made the best margaritas in the afternoon as we relaxed by the pool. We did a few city tours and trips to the beach but mostly just stayed at the Villa in love with the View. I felt for the value we really could not have done better for a such a nice Villa in that great location. The owner was nice and very easy to work with and the staff was the best. Thanks for a great time, we have already planned our next trip to Villa Ladomar! Fabulous Vacation Villa - Great Owner and Staff ! We were very luck to find Villa Ladomar in Acapulco and every day we were there exceeded or expectations. We were picked at the airport by Jesus the Villa administrator who helped us with are bags and within a few minutes we were on our way to the Villa. When we got there the staff was waiting for us and had a late lunch ready and we were very impressed with the incredible view of Acapulco Bay. The Villa was clean and well equipped with about everything we needed and with its 4 nice size bedrooms it was more than large enough for our group of 8 people. Armanda the cook was just excellent with everything she prepared for us and the Kenny the houseman made us mixed drinks and served us by the pool. They really made us feel like Kings and Queens and Jesus come by to check on us everyday and to see if we wanted to go on any city tours or other tourist fun. The owner was very nice and very easy to deal with and made us a great deal on this wonderful Villa. We have already booked our dates for next year and cannot wait to return to your new spot in paradise! Rates are based on 6 people with a small extra charge for over four staying in the Villa. Over the holidays I need a min 5 night booking or min 2 night booking other times. Depending on dates I can normally offer a discount for larger groups so email for more info and the very best rates. Thanks!